Prithvi Shaw (born 9 November 1999) is an Indian cricketer who plays for Middle Income Group (MIG) Cricket Club in Mumbai and was the captain of Rizvi Springfield High School and the Mumbai under-16 team. In November 2013 he had set the highest score by any batsman in any organised form of cricket since 1901 when he hit 546 in a Harris Shield elite division match until the record was surprassed by Pranav Dhanawade on 4 January 2016. "Prithvi Shaw"
He is a right hand batsman and right-arm off-spin bowler all rounder whose abilities as a cricketing prodigy have led to repeated comparisons with Sachin Tendulkar. Shaw is widely tipped to become a full India international. Shaw was a central figure in the documentary film Beyond All Boundaries and has twice been selected to travel to England to further his cricketing education. Shaw has earned a deal worth Rs 36 lakh with SG, which has been endorsed by stalwarts like Sunil Gavaskar, Rahul Dravid and Virender Sehwag in the past. "Prithvi Shaw"
Shaw was born in Thane, Maharashtra, India. 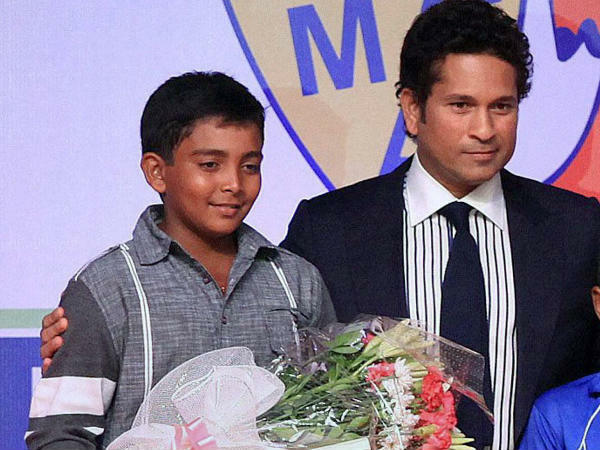 At the age of three, Shaw was enrolled in the Virar cricket academy by his father. His mother died when he was a toddler and his father gave up his business to focus on Shaw's cricketing career. He would play at the beach near JW marriot with his dad and his friends. Even at this age he would be like a lion on the pitch. In 2010, Shaw was offered a contract by AAP Entertainment that allowed him and his father to move to Mumbai and continue his cricketing education.He also receives sponsorship from Indian Oil. Shaw captained Rizvi Springfield to two Harris Shield titles in 2012 and 2013, the most prestigious trophy in Indian youth cricket. In 2012, he scored 155 in the semi-final and 174 in the final match. He trains and plays for MIG Cricket Club in Mumbai, where Arjun Tendulkar, son of Sachin, is a team-mate.His coach is Rajeev Pathak. "Prithvi Shaw"
In April 2012, Shaw was invited to England to play for Cheadle Hulme School in Manchester and scored 1,446 runs during a two-month stay. He scored a century on debut. and averaged 84. He also took 68 wickets.. During his time in Manchester, Prithvi made several appearances for local side High Lane Cricket club. After once scoring 73 runs against a side from the Julian Wood Cricket Academy in England, the academy's founder, Julian Wood, offered Shaw a trip to England in May 2013 and a stint at the academy. He also played for Bradfield College in Berkshire, which includes the former Hampshire batsman and broadcaster Mark Nicholas among its alumni. Shaw spent the 2014 English summer playing for Cleethorpes in the Yorkshire ECB County Premier League. On 6 February 2017, while playing in his fifth ODI for India under-19s, he scored his first century at under-19 level. He made his List A debut for Mumbai in the 2016–17 Vijay Hazare Trophy on 25 February 2017. In November 2017 in the 2017–18 Ranji Trophy, he scored his second consecutive century, and his fourth in five first-class matches since his debut, batting fro Mumbai. He made his first-class debut for Mumbai in the semi-finals of the 2016–17 Ranji Trophy on 1 January 2017. He scored a century in the second innings and was man of the match. He earned another distinction by scoring century in his debut match of the Duleep Trophy and equaled the record held by Sachin Tendulkar who had scored for the first time a century each in his debut matches of Ranji Trophy and Duleep Trophy. In December 2017, he was named captain of India's squad for the 2018 Under-19 Cricket World Cup.